The Practitioners Leadership Institute (PLI) was initiated in 2012 and designed to provide a booster shot for practitioners across the nation. In 2018, we brought our focus home, and are now zeroed in on Baltimore’s up and coming dreamers and doers, preparing them for continued success. Our mission is to provide Responsible Fatherhood, Workforce Development and Family Strengthening practitioners with experiences, skills and information that will strengthen their ability to improve outcomes for low-income fathers and families, impacting black male achievement. Some say the best history has yet to be written, but we think that we’ve got a good head start on ours. In our relatively short time, we’ve been able to empower some pretty amazing leaders (and you can check them out on our Alumni page). Formally established in 2011, PLI is a piece of the greater mission of CFUF (The Center For Urban Families). PLI was created by growth-minded visionaries who wanted to accommodate and lift up the social service and community-based organizations from across the country that visit CFUF every year, looking to replicate and emulate our program models. We get emails, phone calls and knocks on the door from policy makers and community leaders interested in learning about how responsible fatherhood, family services and workforce services directly affect the lives of those that participate, and by media outlets interested in featuring the organization’s successes. Through these first years of existence, PLI has seen tremendous growth and relationship-building, and with those seeds planted, we’ve been able to turn our focus to home. In 2017, through generous funding from the Annie E. Casey Foundation, PLI was able to shine the limelight on local, grassroots practitioners who serve Baltimore’s Boys & Men of Color (BMOC). In April 2018, PLI launched its inaugural 7-month BMOC cohort. This first local cohort featured faculty from the University of Baltimore, as well as other experts. We are very excited about this year’s class and faculty! Let’s be honest; it takes some serious talent to pull all the strings together to create PLI. While The Practitioners Leadership Institute is a program of the Center for Urban Families and all of our staff contribute to the success of the PLI program, the staff members below specifically focus on furthering the success of the PLI programs and pour their hearts into it every day. Wendy Camilla Blackwell’s eclectic career started at the U. S. Department of Transportation and Metro-North Commuter Railroad at Grand Central Terminal (GCT). Wendy also credits GCT as the grand dame that started her love affair with artful community spaces. 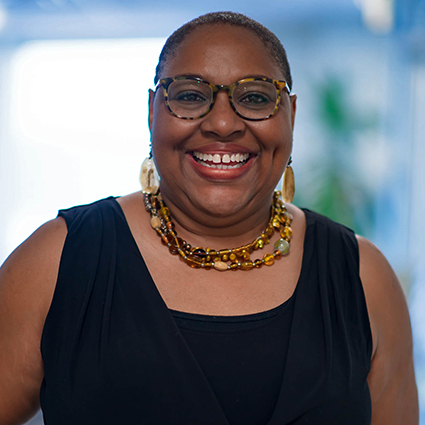 Prior to becoming the Senior Manager of the Practitioner’s Leadership Institute (PLI) at the Center for Urban Families (CFUF), Blackwell was the Executive Director at National Children’s Museum where she began as the Director of Education. During her decade of service, she grew the education and programs departments, developed education initiatives, and shaped the Center for Learning and Innovation. Ms. Blackwell championed community collaborations that produced replication-model child and caregiver learning together programs. At the Center for Urban Families Blackwell leads the Practitioners Leadership Institute (PLI) where she finds joy in developing capacity-building relationships and collaborations with individuals and community. Wendy enjoys the intersection of family, literacy, and art and brings this passion to CFUF with the Family Reading Circle and other two-generation efforts. Wendy is the author of Family Literacy Projects on a Budget Toolkit®, which teaches how to create engaging experiences with children’s literature. She is also a contributing author for A Life in Museums: Managing Your Museum Career, edited by Wendy Luke and Greg Stevens for the American Association of Museums, as well as Children’s Services Partnerships for Success, edited by Betsy Diamant-Cohen. Wendy’s museum-school collaboration won a Promising Practice recognition from the Association of Children’s Museum for her work at Port Discovery Children’s Museum. Blackwell and her staff were honored with the Judith P. Hoyer Award for Outstanding Service to Children by the Prince Georges County Early Childhood Interagency. In addition to writing, Ms. Blackwell is a mother of two who enjoys being a textile artist and leading programs with children in her spare time. She is also an award-winning teacher. Blackwell and her eighth grade students received the Daily Point of Light of the Nation from President George H. Bush at the U.S. White House. Blackwell is a 2016 BaltimoreCorp Elevation Award winner for her ART POWER project where she offers art activities to children ages 5-12 in West Baltimore. Click HERE to view a video about this project. Shawn Burnett is an avid proponent of progress in Baltimore. 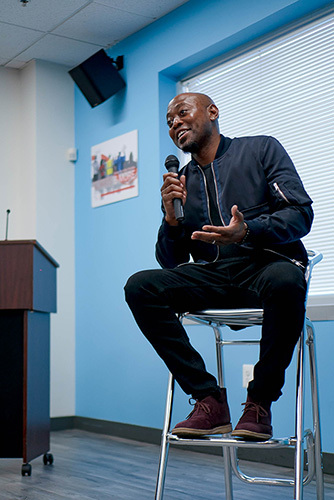 With a degree in Nonprofit Leadership, Shawn began his journey of impact in 2011 as the Founder and Executive Director of Walks of Art, a community organization that focused on the cognitive development, emotional health and social lives of aspiring youth in Baltimore city through arts education, recreation and mentoring. Following the founding of his nonprofit, he then became the Asst. Creative Director for the citywide Black Male Identity Project, where he served as a thought and creative leader for endeavors that dealt with youth and young adults. Now with the Center For Urban Families, where he previously served as Fatherhood Specialist, Shawn is the PLI Academy Manager. In this position it is his duty to help grassroots Baltimore leaders enhance their ability to assist their programs through capacity building, effectively supporting the Boys and Men of color in Baltimore. In addition to his day job, Mr. Burnett serves as a social impact consultant around issues surrounding access and opportunity for people of color. His community focus is evident as he has served in several capacities. Shawn is the former Manager for BMe Community Baltimore, where he was also named a 2013 BMe leader. His work with The Annie E. Casey Foundation and FrontLine Solutions has afforded him the ability to have published research around workforce development and economic opportunity for Baltimore’s opportunity youth population, Reshaping Workforce Development in Baltimore. 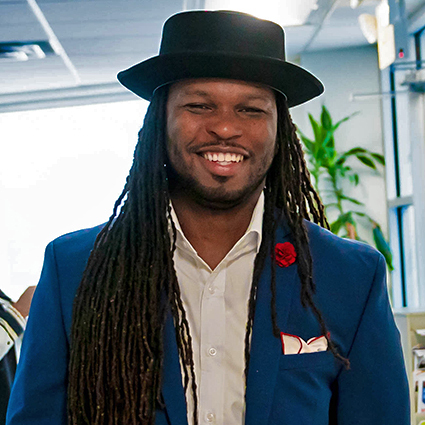 Shawn has worked as a project lead consultant for community focused endeavors with organizations such as: Baltimore Corps – in partnership with Fagan Harris, he created the Elevation Awards and Red Bull Amaphiko, in which he supported their efforts to bring the Amaphiko Academy to Baltimore. He has served in several advisory roles, such as being a member of My Brother’s Keeper- Baltimore (MBK), the Baltimore Corps Advisory Board, and Baltimore’s Youth Leadership and Advocacy Network. Accolades include being voted Baltimore’s Top 10 under 30 (The Baltimore Sun), Baltimore’s Hometown Hero (92Q), a 2014 Open Society Institute- Baltimore fellow, a 2016 Presidents Volunteer Service Award recipient and a 2016 Salzburg Global Forum-Young Cultural Innovator. Certified in Trauma Informed Care (Sage Wellness LLC.) and holding CEU’s in Adverse Childhood Experiences, Shawn is very passionate about moving the Baltimore community forward and contributing to a narrative that depicts the vast amount of strength that exists in its aspiring upcoming generations. Click here to hear more from Shawn.